The cables are similar in design and application to CW 1308, but with Low Smoke Halogen Free cores and sheath. CW 1600 has the added advantage of an Aluminium/Polyester foil screen and drain wire. A fire barrier tape is included on cable with more than 6 pairs. The cables are used for the internal wiring of building when the need to protect people and equipment from smoke and fumes is paramount. The cables are designed to handle low frequency signals for short range applications and intended to be terminated in insulation displacement connectors (IDC). Solid annealed bare or tinned copper sized 0.5mm (24AWG respectively) as per class 1 of BS 6360/IEC 60228. There are two modes of construction: layer for general use, including two cables for installation in customer’s premises where a good appearance is required; and unit of 20 pairs which includes an insulated earth conductor of 1.38mm, for use with customer distribution scheme. 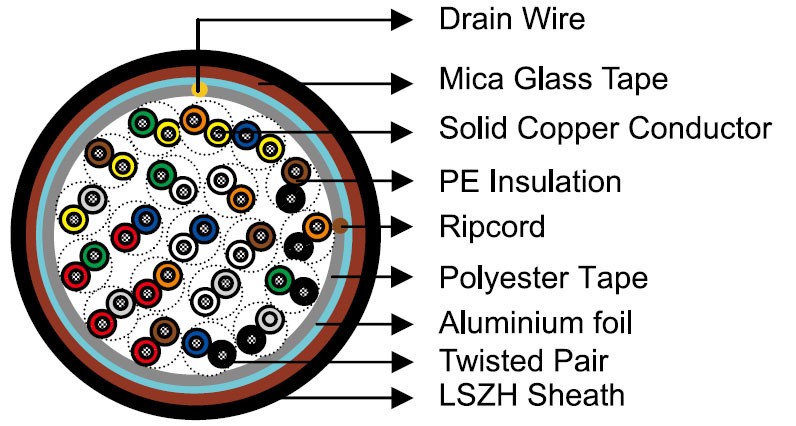 Cable containing more than 12 wires have a polyester tape applied over the cable core prior to sheathing. evolved during combustion of compound. The hydrochloric acid yield should be less than 0.5%. Note 1: Uppercase letters indicate the base, solid colour of insulation, and the lower case indicates ink bands applied onto the base colour. Note 1: ½ refers to sub-units of 10 Pairs. Note 2: These cables include the single 1.38mm diameter insulated conductor. Note: The “E” in the table above indicates that the cable contains an earth-wire.